"Parenting is a daily dependence on God to guide your every word. Some are to be spoken, some are not." Continue reading as Amy Edge shares her personal and honest experience with parenting and what the Bible revealed to her. "And then there it was! The question…, ”So Mom, what am I supposed to do about all of this?“ Immediately a flood of all my decisions, both good and bad, came to mind." Read on to hear what Katie Holland has found to be her secret to life. Do you ever feel like your tank is running low? Do you look to your husband to fill it? Read on to see what Elizabeth Faulk shares about how God is the only one who can truly fill our tank and what the Bible has to say. Do you struggle with trusting the Lord when it comes to raising your children? Is there a disconnect between training your child and trusting the Lord in your life? Read on as Terri Gauldin shares what the Bible has revealed to her about training her children in a way that honors the Lord. "Even our doubts and fears and our deepest heartache will be blessed when we bring them to the Lord with honest hearts. What peace it brings to know that it is okay to admit weakness, to not love our circumstances, or even to be angry." Continue reading to hear Courtney Jennings' testimony of experiencing the unimaginable and how the Lord met her in her suffering. Does the thought of opening your home to others make you shake and sweat? Read on to hear how Mitzi Chambers shares what the Bible says about serving outside of our comfort zone and opening our homes with a heart of hospitality. Being brought up in a Christian home, our family went to church every time the doors were open. Right before my 15th birthday, I met my husband, Bud, and he began attending church with me and my family. We started dating and a year later, my Dad committed suicide. As young teenagers, we grew together in this tragedy, but I didn’t really deal with the trauma. In November of 1979, we were married and had our first son, Allen, in May of 1980. We were young but felt ready to jump into marriage and family. At that time I was 17 and Bud was 19. Three years later, Bud joined the Navy and the times of separation were difficult. However, Bud received very good training, and God has used it to provide for us through the years. Shortly after joining the Navy our second son, Cliff, was born. We were kids raising kids but God was good and through it all, our trust in Him was what has made a difference in our lives. We had some very difficult times that would seem impossible to overcome by the world’s standards but with God all things are possible. We do not have to do anything alone! God is always there! He provides people and organizations that can support us when we feel hopeless. No matter how long we wait, we will eventually have to deal with things that have happened in our lives and the sooner, the better. It’s a hard but necessary process. 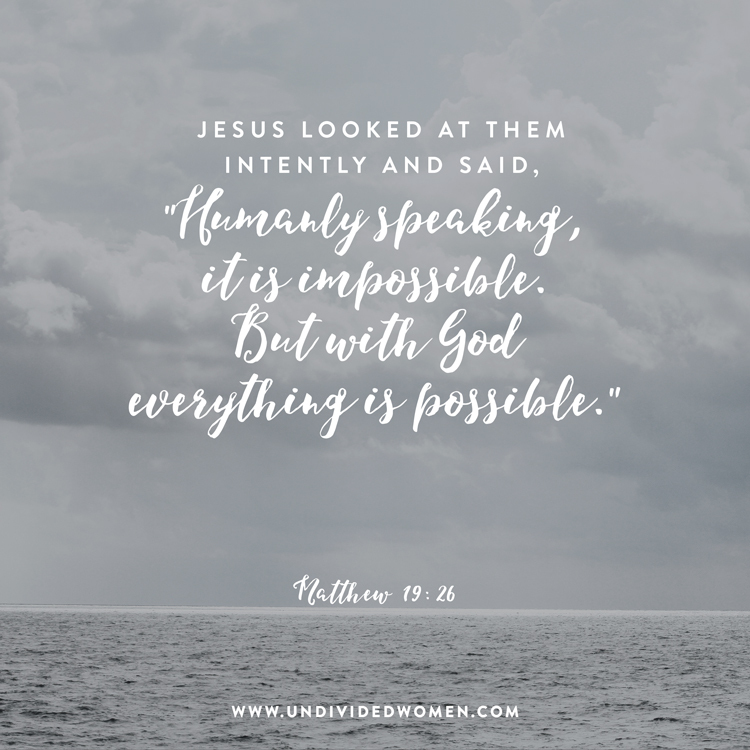 My husband and I received amazing Christian counseling that has gotten us through what may have looked like some impossible moments from a human perspective. However, nothing is too big for our God! We all have an enemy who wants to destroy us but God has a plan for us. If we trust in him, He will walk with us through everything we go through in this life. I am a living testimony of that. It is only by God’s love, grace and mercy that I am who I am today - still a work in progress but one with great faith in a God who can do the impossible! Read 1 Peter 5:6-11 and Jeremiah 29:11. What impossible situations are you facing in your life? How would your daily life be different if you believed God would never leave you or forsake you? Answer any of these questions either in the comments section below or join the conversation with our Facebook Community Group. #undividedwomen. Marilyn and Bud have been married for over 36 years. They have been blessed with two wonderful sons, two great daughters-in-law, and six beautiful grandchildren. They love spending time together and time with their family. They enjoy traveling, ballroom dancing, and chasing waterfalls. They volunteer for Make a Wish and Stephen Ministry as a team. Marilyn is also a volunteer for Women’s Hope Center and Mothers of Preschoolers (MOPS). Marilyn and Bud attend Harvest Church. "No matter where we are or what season of life we are in, we are called to make disciples of Jesus Christ." Read on to hear how Kristen Kite shares how she carries out God's call on her life and gives Biblical advice about finding our call regardless of the season of life. "Praises be to God, in my moment of deepest despair, the God of light and life and hope manifested Himself mightily!" Continue reading to see what Kim Ledbetter shares about how God brought her out of her darkest moment. "The real work of parenting is in guiding the hearts of my children toward their Heavenly Father. The problem? I can’t see their hearts." Read on to see what Dana McCain says about parenting and trusting the promises of the Lord. In spite of my circumstances, God gave me a real peace that surpassed my understanding." Continue reading to hear how Courtney Calhoun shares how Christ used suffering to draw her closer. "There are many times, we as women, want to take charge and handle everything ourselves. We must take the time to be still and look to the Lord for help in every situation, big or small." Continue on to see what Michelle Colbert learned about being still and waiting on the Lord. "The enemy wars against us daily. He wars for our safety, for our sanity, for our families and especially against our God given missions here on this earth. We have a secret weapon that many do not know about!" Read on to see what Cara Coleman shares and how the words of Revelation 12:11 spoke to her. "What will it take to remind you that the Father is right there waiting for you in the midst of the chaos?" Read on to discover what Chelsea Keener shares about God's love and grace for us and how it can be the best example of how to parent our children. "Where do you need to believe God will see you through your circumstances no matter what?" Read on to hear how Lori Smith shares her experience of letting fear creep into her life and then ultimately facing her worst fear. "Has your home become a dwelling place only? Or perhaps a show place to impress others?" Read on to discover what Margaret Kennedy says about our homes and our responsibility with this gift. "What can we do then, as wives and dreamers, to continue sharing our aspirations with our husbands without suffocating them?" Read on to see how Abby Maddox shares the story of Esther to display an example of a wife that dreamed big. Does the thought of opening up your home make you feel stressed? "What if people catch a glimpse of something about us that shows our weaknesses—something in my parenting, my marriage, my housekeeping, or my cooking?" Read on to see how Betsy Morris shares what the Bible says about hospitality. "Why is it so hard to extend grace and preference to our husbands?" Read on as Tamara Davis shares a lesson of surrender and grace within her marriage. Do you worry about your titles? Do you worry that you won't impress people? Read what Rachel Moore shares to discover what the Bible says about our only true title and giving up all other earthly titles.